More and more restaurant owners are reaching beyond their dining rooms to bring in business, by catering. Both on-premise and off-premise catering have become increasingly common for many restaurants. Restaurants with private dining rooms and banquet facilities can increase sales by catering private parties and large functions such as weddings, holiday parties, and business conferences. Off-premise catering is another area of the restaurant industry that continues to grow. Many restaurants who cater offer to bring their food to the customers, rather than the other way around. • Off-premise catering - The restaurant brings the food to the customer, either in their home or at another location that doesn’t serve food. Some restaurants who cater even rent out their entire establishment for large functions. A restaurant catering menu can be as simple or as elaborate as you want to make it. Typical catered functions feature either plated meals, buffets, or food stations. 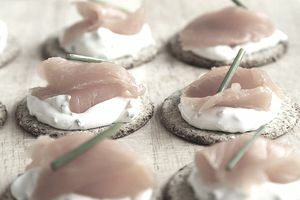 Platters, such as fruit and cheese, shrimp cocktail and antipasto are easy to prepare and transport if you are catering off-premise. A restaurant catering menu should be more flexible than your regular dining room menu. You can’t simply offer everything on your dining room menu as part of your catering menu since a lot of dishes won’t hold up for the long period time that catered food sometimes requires. When pricing your catering menu, do your homework. Find out what other local caterers and restaurants who cater are charging for catered events. Also, check out your local grocery store and find out how much they are charging for party platters and meals. Additionally, restaurants who cater may have a time limit for the use of their function room and may charge an hourly fee beyond that limit. If you choose to offer restaurant catering in addition to your regular restaurant business, you need to make sure you are adequately staffed at both venues. Restaurant catering offers you a chance to increase both your sales and your customer base. People already love your food, so why not capitalize on that and offer catering services as well? Don't own a restaurant? That's okay. Starting a self-catering company is a good way to in the food business. If you like to cook and like to entertain, a self-catering business may be the ideal career for you. Starting a self-catering business requires small start-up costs and can be a step toward one day opening your own restaurant.